BAGNO DI ROMAGNA – The municipality of Bagno di Romagna lies in the valley of the Savio river at an altitude of 339 m in the bottom of the valley and ot 1500 m on the ridge of the Apennines. 49 Km from Cesena. The territory stretches mostly along the river valley and partly along the next valley of the Bidente, reaching the Apennines ridge and the border with Tuscany. 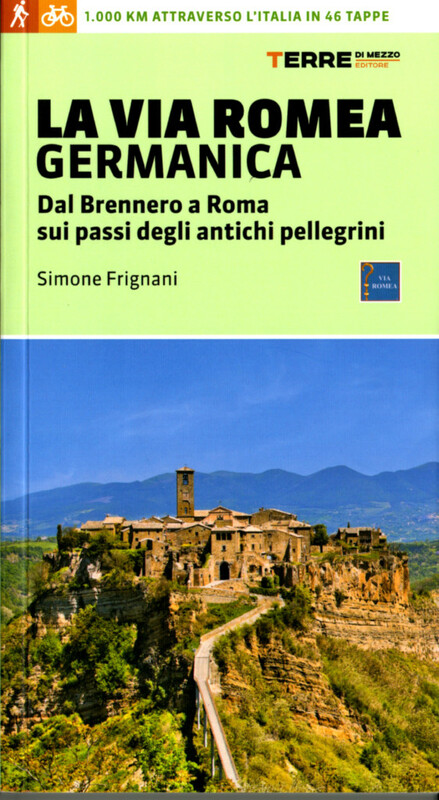 An interesting aspect is that the distance from Arezzo is only 66 Km and this explains why the town has long been a halting place for travelers either way crossing the Apennines at the Serra pass from Tuscany to Romagna and vice versa. This mountainous part of Romagna has been part Tuscany since the Etruscans, this is because the flocks of the mountain pastures were driven to the Tyrrhenian coast in a “transhumance” and paid taxes in Tuscany. Whereas the farmers of the plain were administratively tied to Ravenna. This oddity was rectified by Mussolini in 1923, because he was a native of the Romagna, and as ignorant of the facts as people are still today. The earliest traces of human settlement in Bagno di Romagna date to the Bronze Age, civilization came first with the Etruscans and then with the Roman Empire, with an increase in population and the building of an efficient road system which connected Bagno with the Umbrian city of Sarsina and with the Etruscan Cesena. The Romans built the first public bath, around which the town grew up prosperous as a station for resting and changing horses. 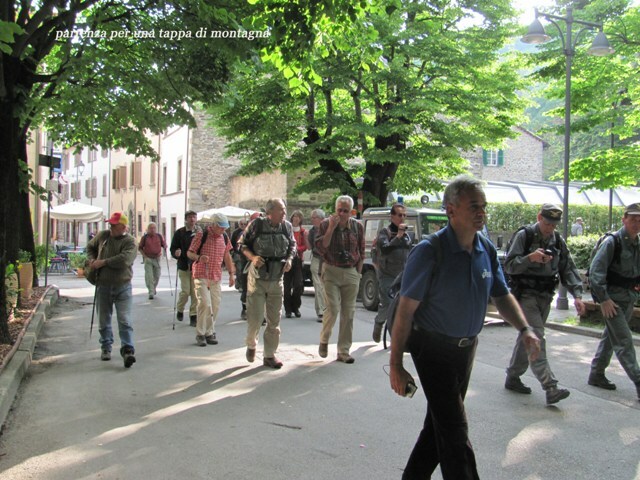 A cheerful company of walkers from the Romagna, taking a break in front of the church of the Corzano Hermitage, before continuing to Bagno di Romagna and tackling the steep Via dell’Alpe di Serra taking them to ridge of the Apennines and Tuscany. The bridge on the torrent Fosso del Capanno at the foothill before the climb to Passo si Serra. Below left the Maestà next to the bridge. The paleo-industrial settlement of Le Gualchiere, is one of the best preserved falling mills of this part of the Apennines. 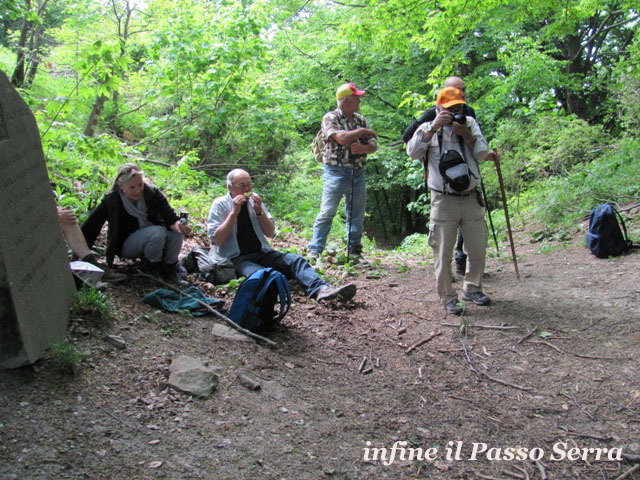 It lies on the left bank of the torrent of the same name, a tributary of the Savio river, and on the Via dell’Alpe di Serra, the oldest known pass of the Apennines. 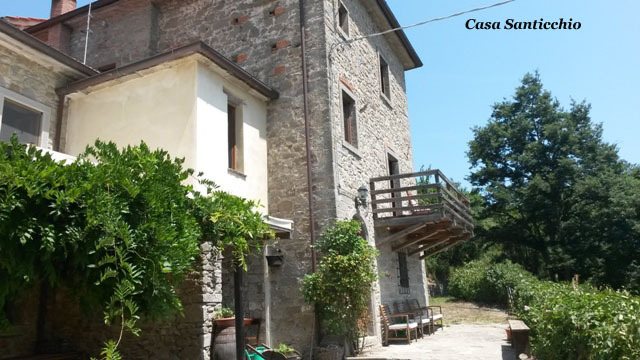 The mill is known to have been restored and enlarged from 1545, by the Balassini family who still owns it having turned it into an “agriturismo”. 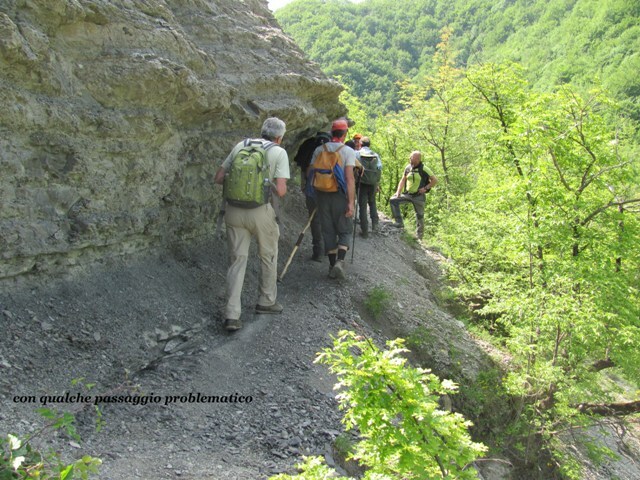 The most exciting part of the Via Romea after Bagno di Romagna is Just passed the shelter of Nasseto, sediments of shales and clays are continuously eroded by the weather and may represent a hazard for the inexperienced walker. The badlands stretch for about 1 km. The road is laid out in a zig-zag fashion adapting to the geological structure of the mountain, in an alternate series of smooth layers and steps formed by superimposed geological layers. In many places the flagstones are covered and preserved under the soil that continually falls from above. For this reason excavations may uncover ancient flagstones, useful for dating the road. Signposting is quite reliable all along the route. The Via Romea stickers are clearly visible. Leaving Bagno di Romagna we first follow the road to Verghereto, in the Tiber Valley which passes by Molino Mazzoli, where biological products are grown and marketed. Beyond the crossroad on the right with the main road to Tuscany State highway 71 (which is the modern substitute of the Via Romea) , we continue turning right towards Le Gualchiere, a large medieval watermill, developed into a workers village since the Middle Ages. 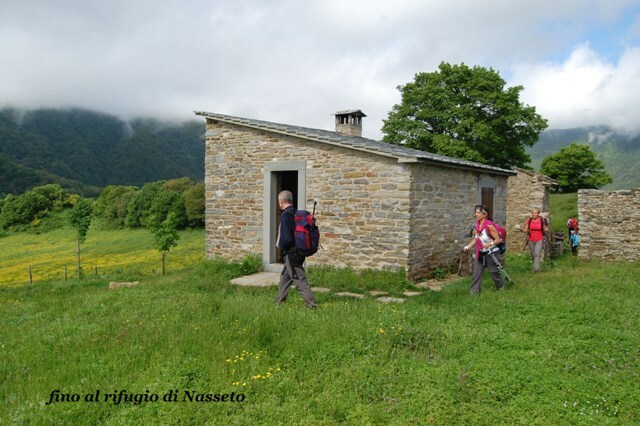 Restored in the 16th century and still inhabited, Today it is an “agriturimo” establishment where the hiker may rest and refreshed before the climb. A little beyond the historical road, now an archaeological remains begins to tacke the steep mountain. After the old bridge over the Fosso Capanno stream, we come to the shrine Maestà Balassini, a typical crossroad shrine dedicated to the Madonna. 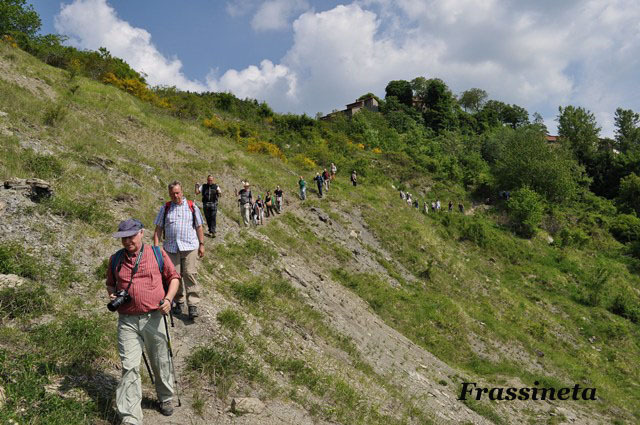 Here begins the stiff climb to the ledge of Nasseto, an endless zigzagging of the ancient road largely in ruins but preserving stretches of ancient paving stones. A masterly work of ancient engineering probably designed by the Romans to enable to climb the steep slope with pack mules, certainly not suitable for any vehicle. We are skirting the border of the so-called Area Wilderness, a nature reserve. Arrived at Nasseto, an ancient halting place for rest and food and drink, Today an unattended shelter for modern pilgrims, with fireplace, and also olive oils and condiments. 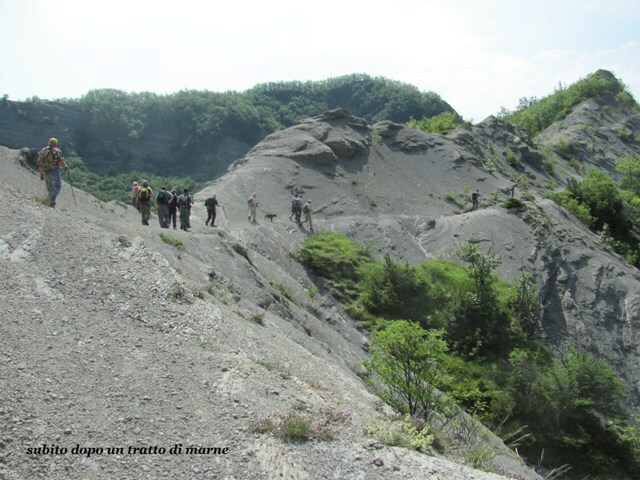 There is a drive leading to Nasseto, flanked by ancient field maples, then the Via Romea starts its most dangerous section on an unstable terrain of shales and clay badlands continuously ruining down a deep gorge. We climb towards the Pass through the steepest part of the road through a beech wood, a series of tight hairpins will soon take us to the Serra Pass or PASSO DI SERRA. Here the people of Bagno di Romagna have raised a monolith with an inscription to commemorate the ancient Via Romea Pass, which is the oldest Apennine pass on record. Here archaeologists have found Neolithic tools, Etruscan and Roman pottery shards, the base of a small church with three skeletons buried in it. We will be now in Tuscany and the landscape is much more appealing and less wild. We begin the descent. A few hundred meters below we come to a crossroad of footpaths, our route is the one continuing straight ahead, the path across is the Apennine bridleway, leading, to the left to LA VERNA and to the right to State Highway SS71 (Mandrioli pass) which in the 19th century replaced the Via Romea. We carry on ahead aiming at Serra, the first village on the Tuscany side. The footpath is at times invisible, but in the distance we see Corezzo the largest village in the valley. Finally the first red roofs of Tuscany will be manifest in Serra. Now the offspring of the original inhabitants live in Florence but still own the ancestral homes and use them as Summer retreats. So the village is well kept and nicely restored. 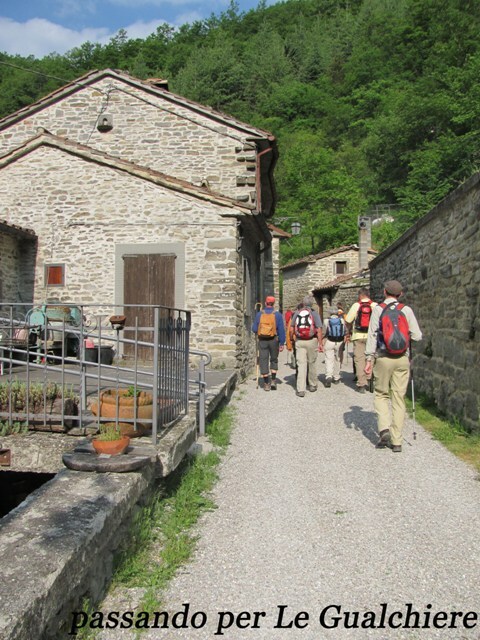 Past the village we descend to the hamlet of Serra di Sotto, we cross a make do footbridge over the torrent whose stone bridge collapsed a few years back, and we soon reach Corezzo arriving by the path next to the parish church. 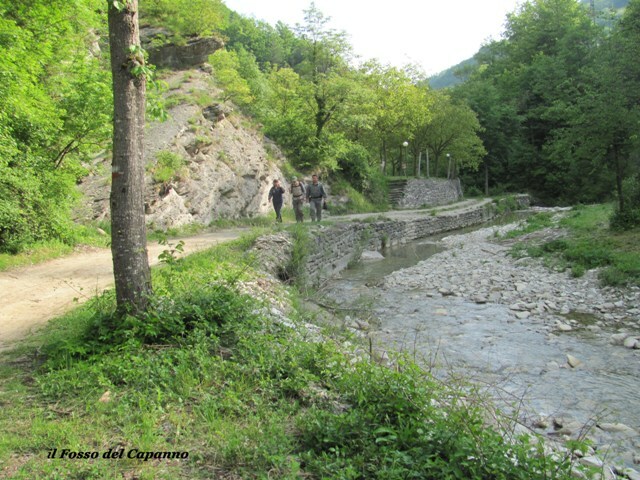 From Corezzo we descend precipitously into the torrent be to find a wooden footbridge, then we have a stiff climb to reach one of the loftiest villages of the Casentino, Frassineta circa 860 m a.s.l. Next to the church in the higher part of the hill we may notice the ruins of a watchtower dated by the stone work to the 10th century. Surely related to the Via Romea, like other towers: Serra, Corezzo, Banzena, on the same route. Continuing from Frassineta we reach Poggio della Forca (the Gallows Hill) where we turn left and descend along a rather rough footpath through the woods, until, after some struggle, we reach Casa Santicchio, a large farmhouse, now an agritourism establishment, where we find very nice people, refreshments, good meals and very fine bedrooms in an idyllic environment. ALTERNATIVE ROUTE VIA LA VERNA – From the first crossroad of paths below the Serra Pass we shall take to the left, footpath “00” at 1090 m of altitude, instead of descending to Corezzo. 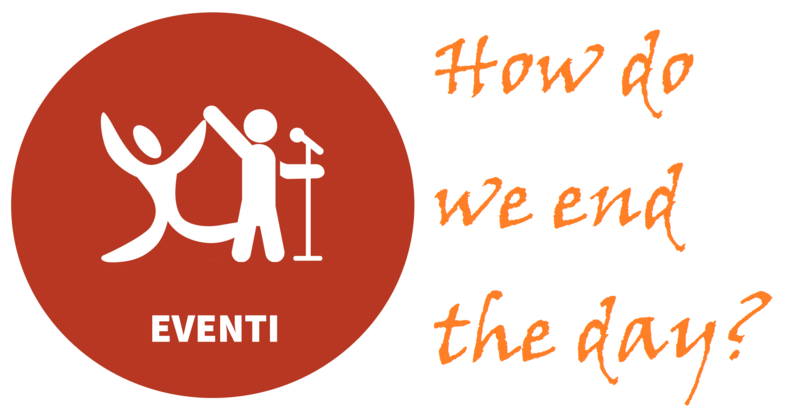 We follow the signs to Verghereto/La Verna mostly walking on the crest of the Apennines an ancient ridge way used since prehistory by shepherds and hunters. 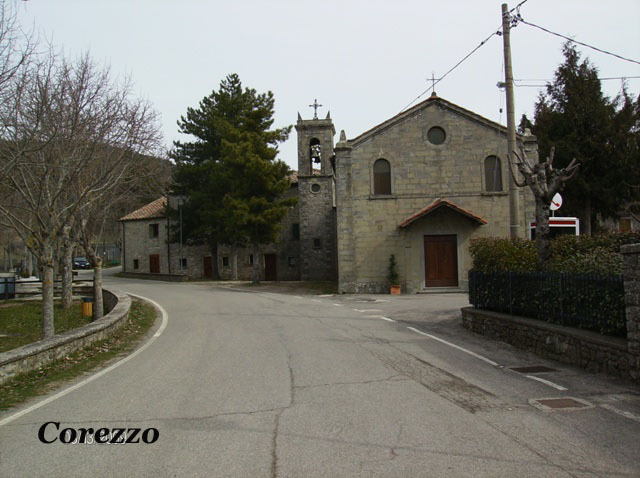 We shall soon reach the landmark of Poggio Tre Vescovi at 1238 m asl. 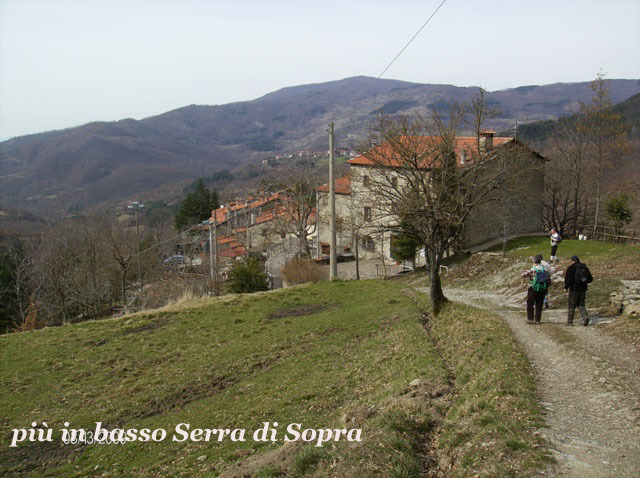 The ancient boundary of three dioceses: Arezzo, Sansepolcro and Sarsina, we have walked one third of the route to La Verna. Here the path runs downhill for a long tract of the ridge way following now path N° 50, till we cross the Forestry road to Rimbocchi. Presently we follow another Forestry road directed to La Verna, crossing over the Passo de Le Gualanciole, then another Pass, of Le Pratelle. Here we leave the Forestry road and continue towards La Verna on a dirt track. We pass the steep Monte Calvano, our last climb. As we approach the great rock of La Verna we come to a great wooden cross (Croce delle Celle) a sheep counting landmark for shepherd driving their flocks to the Tyrrhenian coast for the Winter. We are now below the lofty peak of Monte Penna. A pleasant walk through mixed woodland will take us to the gates of the world famous Franciscan Sanctuary. We will have covered 16 km in all. La Verna may also be reached from Corezzo. In such case we descend to Rimbocchi and after a tract of tarmac, at the first bend we take a path that will take us on the tarmac again much further down; after having crossed the Serra torrent we take footpath N° 068 which with a stiff climb will take us to La Verna by the old hostel of La Beccia which was instituted for female visitors, who were not allowed into the Monastery in times past. From this place we take path 043 that takes us on the road to Bibbiena from which along the cobblestone road we enter the ancient gate on the monastery (1179m) Once at La Verna, to return to our Via Romea, we exit the Sanctuary from the ancient gate to La Beccia and follow path N° 043, we take the maiun road to Bibbiena only to leave it shortly after to take path N° 033 which we shall follow all the way downhill for about 7 Km, until we see on our right the start of path N° 042 which will take us to Sarna. Continuing instead to the left we shall arrive at Croce di Sarna. 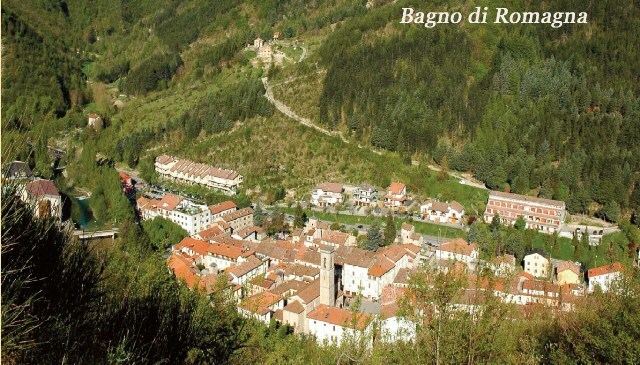 Either way we will be on the right track for Subbiano, The Convent and Sanctuary of la Verna is situated above the town of Chiusi della Verna on a massive spectacular rock, within the National Park of the Forests of Casentino. It is famous for being the place founded by St Francis of Assisi and for the Saint having received his Stigmata in this very place on the 14th of September 1224. It was built on the southern end of the rock called Monte Penna at 1128 m of altitude. Numerous pilgrims visit the Sanctuary not only for its historical value but for the numerous works of art consisting mainly of Della Robbia terracottas. Their the largest collection is at La Verna. It is the most important Fanciscan sites after Assisi, which may be reached with a long pilgrim’s route starting precisely from La Verna. The great rock was once a place of pagan worship as mentioned by classical poets. The female deity residing there called La Verna was protectress of highwaymen and banditi who attacked traders travelling across Italy from the Adriatic to the Tyrrhenian coast. In the Middle Ages it was a customs post where merchants paid a toll. The feudal lord who ruled there worried about the devils residing in the place, called upon St Francis to reclaim the area and turn it into a holy place. 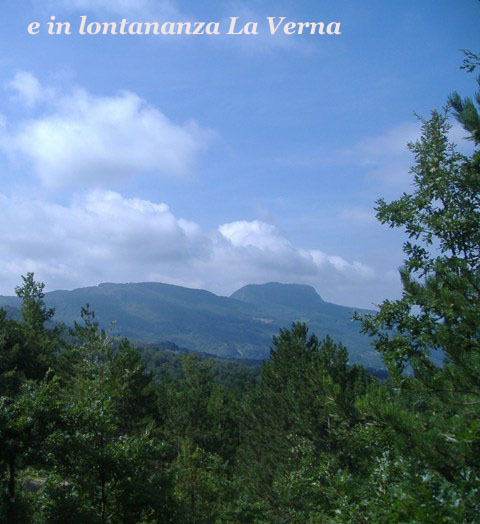 Since then La Verna has been known as “The holiest mountain in the world”. 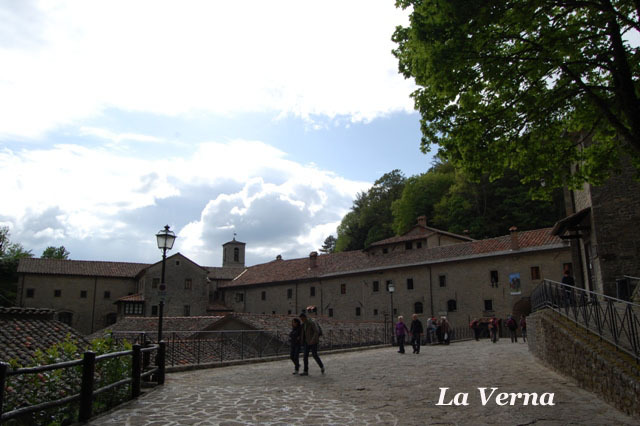 St Francis visited la Verna for the last time in the Summer of 1224. 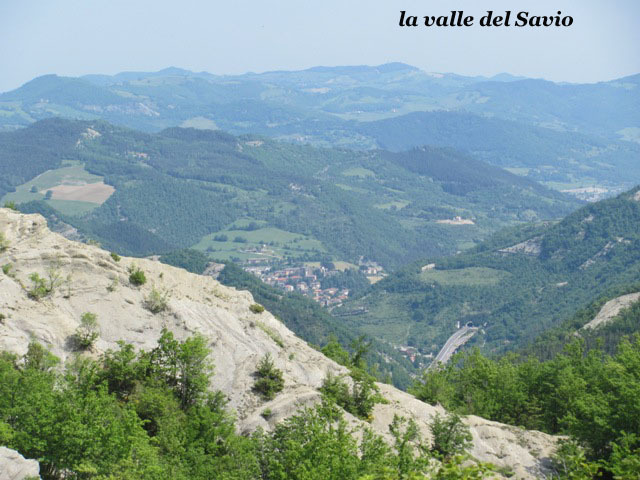 CHIUSI DELLA VERNA – The municipality of Chiusi della Verna extends over a vast territory including tracts of Eastern Casentino, and of the National Forest, it also includes the mighty “Sasso” (Stone) of La Verna. Not far is also the famous monastery of Camaldoli. Chiusi is in a dispute with neighboring Caprese Michelangelo about the birthplace of the great Renaissance artist. Recent revisions of the tradition suggest the Michelangelo was called so because having been baptized (and of course born) in Chiusi whose church is entitled to Michael the Archangel. During the late Etruscan-early Roman period, the villages of Dama, Giampereta, Sarna, Fontechiara, Compoito, Oci and Vignoli, were founded as proved by the numerous archaeological remains, on display in the Museum of Bibbiena. Also Chiusi arose at that time as a customs post for crossing into Etruria from Umbria. The Latin word Clausum-Clusu, indicates a customs and there is indeed an ancient route coming from the Montefeltro on the Adriatic coast, leading to the Etruscan cities on the Tyrrhenian coast. 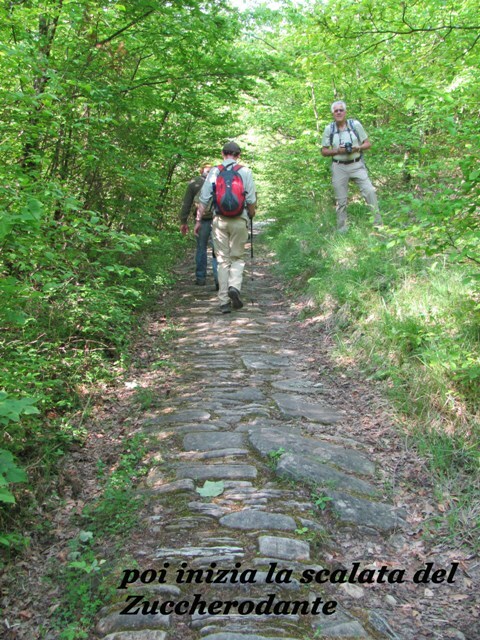 The Casentino was traversed south to north by a Roman Road called Via Major in the Middle Ages, connecting as it still does today as a footpath Arezzo with the Mugello and Bologna. At Bibbiena, this road divided and one branch connecting with the city of Sarsina became later our Via Romea. In the Middle Ages this road branched out at San Piero in Bagno, turning towards Santa Sofia and Forlì where it connected with the Via Emilia collecting pilgrims coming to Rome via the Moncenis, the Great St. Bernard, the Gottard, and the Brenner Passes. After the Frankish conquest of Italy, our road became a short cut for German Pilgrims entering Italy from the Brenner Pass, as an alternative to the Via Francigena far to the west. The Serra Pass has been in use since prehistory as excavations taking place in the early 1990s have produced flint tools, Etruscan and Roman remains and very early medieval building remains, probably a small chapel or a tower with three human skeletons buried in shallow graves. The pass was especially busy from the 12th to the 14th century during the Jubilee years, started in 1300 by Pope Bonifatius VIII. Great was the number of pilgrims that flocked to Rome from every Christian nation, not only from Germany but from the Balkans, Scandinavia and the Baltic countries and, as shown by English Pilgrimage maps, from the British Isles. The route from Saxony entered Italy from the Brenner Pass, it crossed the Venetia and the Po Valley to enter the Via Emilia at Forlì where it tackled the Apennines, as we know. Here, from Bagno di Romagna we enter the actual archaeological road with remains of flagstones for several stretches of the road. Several sites on the Tuscany side, were provided with hostels for pilgrims and also watch towers with toll gates. The villages of Serra, Corezzo, Frassineta, Pezza, Giona, Banzena, are all cases in point, even if towers and precinct walls are now ruins. Via Romea also crosses other districts with interesting relics. Sarna is a splendid village preserving its general lay out, its great tower dating back to the 10th century and a 14th century pilgrim’s hospital by its south gate, which is perfectly preserved to the point of not being suitable for modern pilgrims. Beyond Sarna there are the very ancient village of Rosina and Taena, the Castle of Chitignano, until 200 years ago an independent county, Poggio d’Acona, Valenzano and finally Subbiano, Capolona, Puglia and Arezzo. The route carried on to Orvieto and Rome.